Put the flour and salt in a large bowl. Sift together. Warm one cup of water. Mix in the sugar and yeast into half the water. Stir well, cover for 5 minutes. Add remaining warmed water and 1 tablespoon of the oil into the yeast mixture. Pour into the flour, and prepare a soft and sticky dough. Using flour on a working surface, knead the dough lightly. Add more flour if needed and continue kneading till the dough comes away from the work surface. Knead for around 5-7 minutes, then place the dough into a bowl. Pour 1 teaspoon oil over the dough, turn over to coat completely. Cover loosely with clingfilm and leave in a warm place untill it has doubled in size. Apply a little oil on the baking tin/sheet. Sprinkle a thin layer of cornmeal on it. Press the dough into the tin, cover once again with film, and set aside for another half hour or until the dough is well risen. Remove the film, and sprinkle with the remaining oil and coarse salt. Bake the bread at 400F for 30 minutes or until golden brown and firm to touch. Remove from oven and tin. Be careful, the bread will be very hot at this point. Serve immediately with a soup, dip, or topping of choice. This bread goes to Roma @ Roma's Space. Roma is hosting JFI Wheat this March! They also go to Sandy At The Baker's Bench. I am joining her in her new adventure A Year of Bake Your Own Bread. I have never heard of this one before. Thanks a lot for introducing it to me. 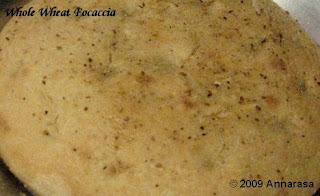 Whole wheat is a wonderful idea for focaccia. Think I'll try it the next time I make minestrone. Thanks for the idea. Looks great! I've only made foccacia with AP flour, but the whole wheat sounds like a good variation. Good to try it. I think it's ur first try. Good idea for trying it with wheat flour.